Exercising is a vital part of staying healthy. With so many different fitness fads and activities out there it’s hard to tell which ones actually produce real benefits and which ones aren’t worth your time. While yoga has been around for quite a while now its popularity has grown significantly in past years. The general population seems to have decided that its results are worthwhile, but what kind of benefits does it have for individuals with disabilities? Yoga is a combination of body and mind. It focuses on not only working your physical state, but your mental state as well by incorporating calming breathing and focusing techniques that most don’t even realize they are reaping the benefits from at the time. One of the best parts of yoga is that it is so easily adaptable to all different fitness levels, so individuals of all capabilities are able to participate at the same time (including individuals that use a wheelchair). Holding the different poses, such as downward dog, cat, tree, etc., engage many different muscles at the same time to strengthen and stretch muscles all over giving you a total body workout. These strengthening activities, which help build muscle control and stability, are great for individuals with disabilities that can make them more prone to muscle weakness. The gradual building of muscle and flexibility overtime using your own body weight aids in reducing the risk of injuries associated with other activities involving heavy weights or machines. These moves and poses rotate joints through their full range of motion helping individuals with disabilities learn to concentrate on specific body parts to improve fine and gross motor skills. It also gets blood flowing throughout the entire body to improve circulation as well. This increased knowledge of balance and control will help with mobility, reducing falls, and hand/eye coordination. Being more aware and in tune with their bodies can help individuals feel more comfortable and confident in their own their own skin. In addition, there are also many psychological improvements from yoga too. While yoga is an activity that is done individually going to yoga classes lets individuals be a part of a group of their peers without having the stress from other team sports where their individual performance is going to affect the teams’ outcome. Learning and mastering the different poses leads to a feeling of accomplishment and pride, thus increasing self-esteem levels. 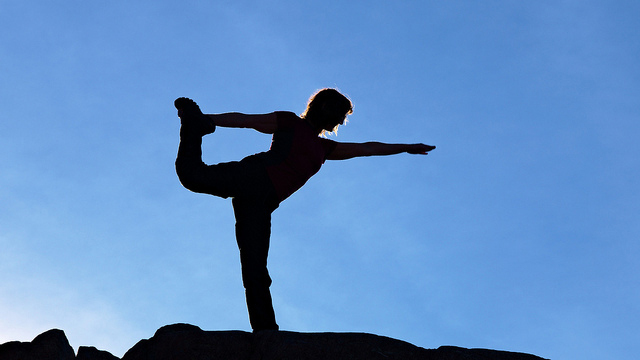 Yoga has also been shown to increase focus, concentration and decrease feelings of anxiety. The calming effects that yoga introduces on the body can even be used outside of the yoga classroom in everyday life to reduce negative behaviors. For example, the breathing techniques can be brought into play when individuals start getting angry, aggressive, or stressed to bring them back to a relaxed state. Another great thing about yoga is that it doesn’t have to be done in a class. Yoga requires very little equipment and can be done almost anywhere – inside or outside, in the grass or beach, or in a yoga studio or your house. Videos that are adapted for individuals with disabilities can be found on NCHPAD’s website and WhatDisability.com. Other resources and books can also be found online too for extra help and information. Yoga terms can be difficult to pronounce, so change the names of the different yoga poses around to make them easier to remember and support with sounds, phrases, etc. While yoga might not be the exercise of choice for everyone, there are many aspects of yoga that can have positive effects, both physically and mentally, for many individuals with disabilities.